Chest with silver flakes and purple flake flowers and multi color charms, like moon, flower, butterfly, etc. 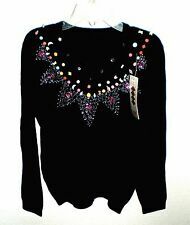 A gorgeous sweater for girls. Length: 18”; Bust: 28"; Sleeves: 18". Made of 83% cotton, 16% polyester and 1% spandex. Very fuzzy and soft red sweater. Great for Valentine’s Day , dressy, or just walk around town. LENGTH FROM TOP OF SHOULDER TO BOTTOM OF SHIRT: 21". SUPER CUTE SHIRT! Inventory ID-2. Abercrombie and Fitch Girls Sweater. CROCHET KNIT SWEATER. 100% COTTON KNIT. LONG SLEEVE. YOU CAN ALSO COMPARE TO A SIMILAR ITEM YOU ALREADY OWN THAT FITS YOU WELL! ALL ZIPPERS AND BUTTONS CHECKED ON CLOTHING. LENGTH 18". SCALLOPED BOTTOM HEM. Type: Sweater. see last picture for more sizing information. Color: Green. Size: Large. Length : 22". This item is sold as is. I strive to get the item to you as soon as possible.